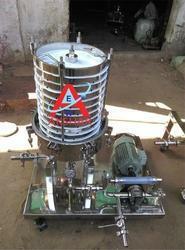 Pioneers in the industry, we offer alcohol filter press filtration machine from India. Backed by rich industry experience, we are manufacturing, supplying, trading and exporting ALCOHOL Filter Press. These filter presses are manufactured keeping in consideration the variegated requirements of our respectable customers. Our experts make sure that qualitative stainless steel is used to manufacture the offered range of presses. Looking for “ALCOHOL FILTER PRESS FILTRATION MACHINE”?